This is a glorious day of hot sun, blue sky, warm sea – and noisy crowds. 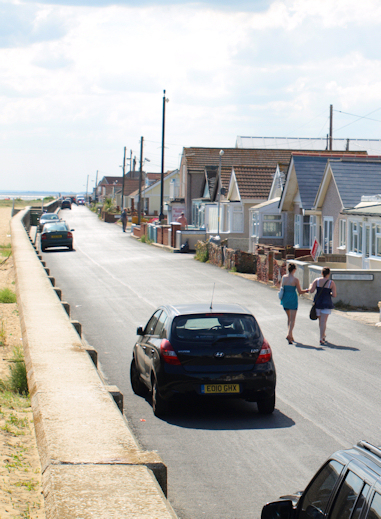 I walk along the busy road from Kirby-le-Soken to Walton-on-the-Naze. This is the hottest day of the year so far. Temperatures are going to soar into the 80s (that is the high 20s if your mind works in Centigrade). Luckily there is a pavement along this stretch of road. The marshes are to my left, behind a high hedge. Through gaps in the hedge I can see the distant sea and, beyond that, the cranes of Felixstowe. It seems a long time since I left Felixstowe – yet still so near. Ahead of me I see a car stop. Two young people get out and begin searching the grass verge for something. She points to various spots and he, hot and agitated, stomps through the grass – looking. Then he shakes his head, she points to another spot and the search begins again. As I draw near they both begin to shout in triumph as he emerges from the hedge holding a hub cap. They grin at each other and at me, then climb into their car and roar off. As I approach Walton, I see smart people wearing dresses and suits – looking hot, sticky and uncomfortable as they walk purposefully onwards. They are going to church. It is Sunday. Walton Pier is the 3rd longest in the country. I suppose I was expecting something spectacular; and am disappointed by the reality. The beginning of the pier seems to consist of a shed and, as I draw nearer, I realise that this shed houses a number of tacky amusement arcades, children’s roundabouts, dodgems, and some cheap looking cafes and bars. I am very hot and go into the shed area and walk through, looking for a cafe or a stall selling drinks. At the end of the covered area the pier stretches out to sea. There are fishermen and people walking. But no nice cafe and no cold drinks to be seen. I head back to the entrance of the pier and buy an orange drink in an unpleasant looking self-service restaurant. I want to sit outside, but am driven back inside by the clouds of smoke. Smokers – now banned from the indoors – have taken over the outdoor seating area. Refreshed by the drink, I head southwards toward Frinton. On the promenade are people enjoying this wonderful day. The tide is high and the beach is covered with water, making the promenade the main area for walking, sitting and playing. There are beach huts, doors open, with chairs and tables out on the promenade. Further on I see people swimming in the sea. The sky is cloudless and the sea is a beautiful, bright blue – a tropical hue rarely seen in this country. The rest of my walk follows the promenade as Walton passes and I head into Frinton. To my left is the sea with a wind farm in the distance. To my right is an endless parade of beach huts. The walking would be easy – but the promenade becomes increasingly crowded as the day progresses. I am forced to dodge tables, chairs, barbeques, toddlers, dogs, pushchairs, wheelchairs and the occasional, powered, mobility scooter. Then I reach an area of open space – Frinton Greensward. Here people are out having picnics on the grass, overlooking the sea. And I am glad to find some convenient (and very clean) public conveniences. Leaving Frinton and heading on to Clacton, I walk along the high sea wall. 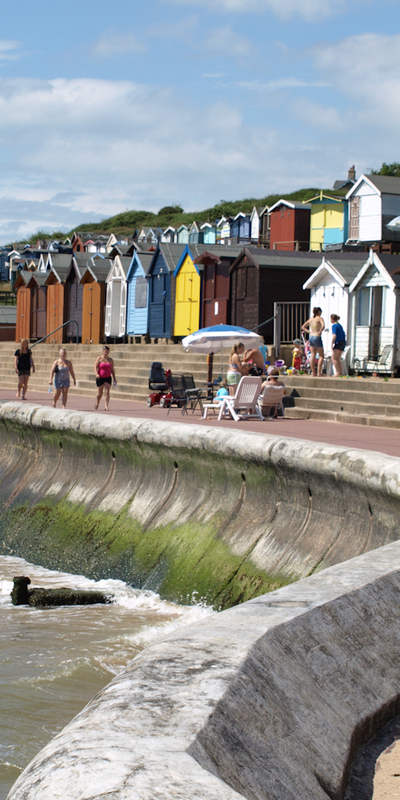 On the edge of Frinton are some amazing beach huts – accessed from the sea wall via small front decks, they are built on stilts and jut out over the beach with waves sloshing underneath. The windows at the ‘back’ of these huts look directly over the sea. Wonderful. Now I follow a quiet stretch of sea wall, between Frinton and Clacton. There are a few dog walkers and some cyclists. When I reach Holland-on-Sea, the promenade becomes crowded again, with beach huts and people. I am tired and want to find a pub for lunch, having pre-arranged to meet my husband here. So, I leave the beach and climb upwards to a wide promenade that runs above the beach. There are houses to my right, but no sign of a pub. 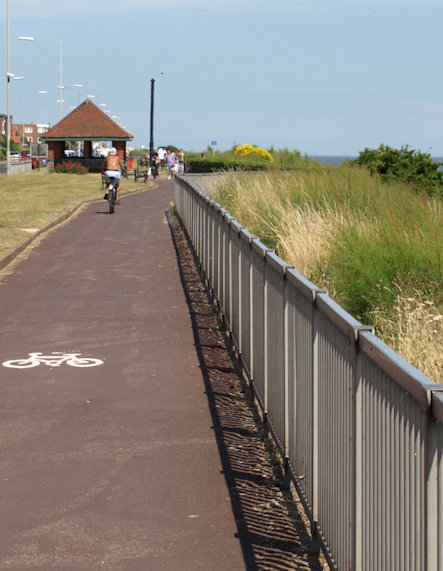 The promenade is also a cycle way. I wonder if I will meet my husband cycling along? I walk for miles, growing thirsty and feeling hungry, passing some nice looking houses – but no pubs. Eventually I stop in a shelter and eat a banana and drink most of my water. I text my husband to let him know the bad news – there are no pubs in Holland-on-Sea. Then I set off again and, consulting my iPhone Trip app, I realise I have passed through Holland-on-Sea and am now in Clacton. Then, ahead, I spot some umbrellas. That must be a pub. Please let it be a pub. Striding quickly onwards, I am overtaken by a cyclist. Ah, here is my husband. We reach the pub together and sit outside in the shade. We have a roast dinner; perhaps not the most sensible thing to eat in the heat – but we are both starving. We watch people walk past. There are girls in white trousers with astonishingly large amounts of gold jewelry. This is Essex, after all. After lunch, I carry on towards Clacton Pier, descending down to the beach again and walking along the sea wall for a while, before, tired by the noise and crowds, I climb back up to the promenade. Clacton is surprisingly pleasant. There is a park up here, with gardens and benches to sit on. And here there are good views of the pier and its small amusement park. It may be shorter than Walton, but this is a much nicer pier. Carrying on, I leave Clacton behind, passing another Martello tower and head towards Jaywick. The beach becomes wider with more shingle. 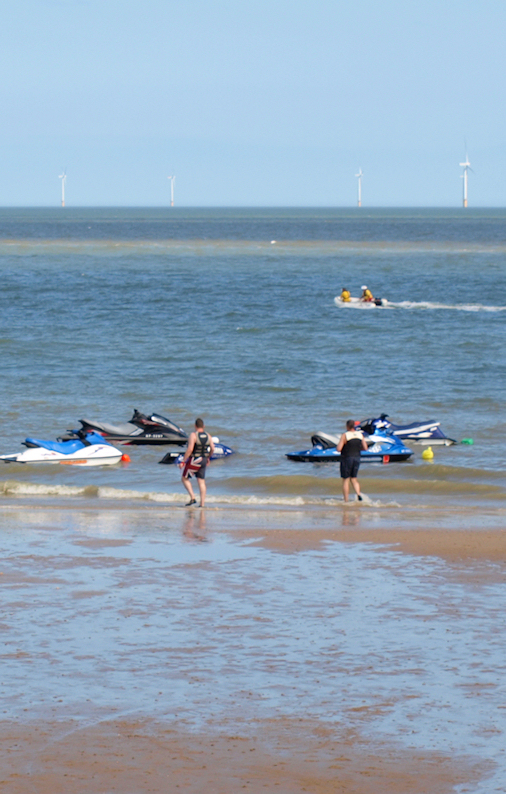 There are jet skis buzzing on the sea. On the path, the people become fatter and have tattoos. The dogs become larger, straining on leashes. Cars drive past pumping out loud music. Instead of beach huts, there are small, tatty beach houses. Their gardens are untidy with broken toys, old furniture and discarded rubbish. I see broken windows, boarded up windows, and windows open with music blaring out. The sea wall becomes a wall, instead of a walkway, and I am forced to walk along a narrow road, flattening myself against the wall every time a car drives past. There is broken glass on the road. This is not pleasant. I pass some of the last of the Martello Towers on this stretch of coast. Further on, there is a commotion ahead. I am approaching a place called St. Osyth Beach. Here people are sitting on the beach wall. There is music playing. As I approach, I realise there is an open-air karaoke bar in full swing. It is 6:30 pm. This is where I have arranged to meet my husband. There is no escape. I sit on the beach wall and watch three young women singing tunelessly on a small stage. My husband arrives in the car. What a welcome sight. I am glad to leave this place behind. Vital stats: 12 miles, max temp 82 F, 1 new blister. This entry was posted in 04 Essex and tagged beach, beach huts, Clapton, coast, coastal, england, Essex, Frinton-on-Sea, hiking, Jaywick, martello tower, path, pier, St Osyth Beach, UK, walker, walking, Walton-on-the-Naze. Bookmark the permalink. Lovely beach walk! It reminds me of walking along the Irish coast of Bray with my favorite dress and leggings.